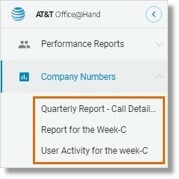 You can generate a report from AT&T Office@Hand Analytics Portal using Company Numbers. Follow the steps below to know how to create a Company Numbers Report. Select the preferred Company Numbers report — Numbers or Calls. – Set the filters for Company Numbers and/or Call Length, as needed. Click Select KPIs, then select the preferred KPIs from the list. Click Done. – Data will be shown under Trend and Company Numbers once set. You can click Download or Save your report. When saving a report, you can enter a name or overwrite the report using the same name. Saved reports can be accessed from the left pane by clicking Company Numbers.